I had broken my hand several years ago and I’ve had a problem with arthritis in my fingers, especially the hand that was broken and now my arthritis has stopped bothering me. I couldn’t sleep at night. I used to wake up and then I couldn’t get back to sleep because of some shoulder pain and other aches and pains. I get a great night’s sleep now. I used to have pain in my arm from my elbow down to my fingers and that’s gone away since I have been under chiropractic care. I had a stress test recently and I passed with flying colors. That had me on the machine for 30 minutes and when it was done I said to the Doctor, is that it? I just got started. I have bad knees from playing football when I was young and even they are doing better. My neck was always stiff and when I was driving I had trouble turning my head to the side. My neck moves a lot easier and now I can turn it in all directions. I have a lot more energy. When I walk on the track I can walk a mile in less than 20 minutes. 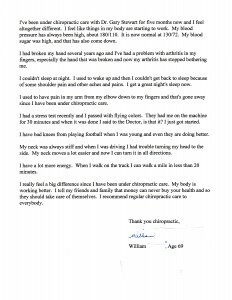 I really feel a big difference since I have been under chiropractic care. My body is working better. I tell my friends and family that money can never buy your health and so they should take care of themselves. I recommend regular chiropractic care to everybody.